St. John's School of Law, J.D. 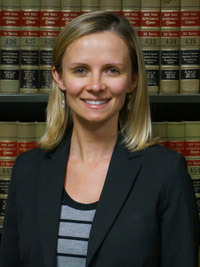 IRYNA S. KRAUCHANKA is the head of the firm's Appeals Department. She briefs and argues complex appeals before all four departments of the Appellate Division, the New York Court of Appeals and the United States Court of Appeals for the Second Circuit. Ms. Krauchanka has extensive experience with a vast array of civil litigation matters, including Labor Law, medical malpractice, premises and municipal liability, contractual and common law indemnification claims, as well as on the topics of judgment reduction, evidence admissibility and civil procedure. She stays abreast of developments and changes in legal precedent and offers guidance to other attorneys in the firm. Mrs. Krauchanka was selected to the 2015 and 2016 New York Super Lawyers Rising Stars list for excellence in Appellate Litigation. Each year no more than 2.5% of the lawyers in the state are selected to receive this honor. Muth v. Wali Mohammad, M.D., P.C., 132 A.D.3d 429 (1st Dept. 2015) - obtained a reversal of the lower court's order and a dismissal of the plaintiff's medical malpractice claims against a facility that offered psychological services to the plaintiff's decedent. The Appellate Division agreed that the examining psychologist exercised his professional medical judgment in his evaluation of the decedent who later committed suicide, including a determination as to whether to inquire about the decedent's access to firearms. The First Department also concluded that the choices made by the psychologist were not a proximate cause of the decedent's suicide, which did not occur until three weeks after the last visit. Park v. Kovachevich, 116 A.D.3d 186 (1st Dept. 2014) - successfully reversed the denial of summary judgment to an internal medicine specialist and osteopathic physician in another medical malpractice action involving a suicide. The Appellate Division dismissed the complaint against the physician, holding that he was not liable because his actions did not cause the suicide. The Court declined to consider the plaintiff's new theory of liability that the provider should have been held to the standard of care of a psychiatrist. Belt v. Girgis, 82 A.D.3d 1028 (2d Dept. 2011) - obtained a substantial reduction of the damages awarded at trial. The pain and suffering award was reduced from $15,000,000.00 to $5,000,000.00; the medical expenses award was reduced from $12,392,000.00 to $2,212,952.00. The $10,000,000.00 punitive damages award was vacated in its entirety.